There will be an art exhibition on Saturday 20th August, from 2 until 4pm. There will be a raffle for a signed limited edition print by Hamish MacDonald (all proceeds to church funds), teas and coffees, and the church will be open for visiting and contemplation. St Vigeans church has a special connection with the King James Bible, and it is because of this connection that Angus Presbytery have chosen St Vigeans church as the place of worship for their special service to commemorate the 400th anniversary of The King James Bible. The service is open to all and will be held at 7.30 p.m. on Thursday 25th August. Friday 22 April and Saturday 23 April. for viewing and quiet reflection. Coffee/Tea will be served in the hall. 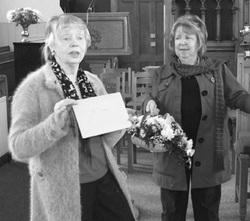 Knox’s Church Guild Annual Spring Fayre will be held in Knox’s Church Hall on Saturday 16th April 10.00a.m – 11.30a.m. Stalls will include Home baking, Book stall, Lucky parcels etc. Everyone welcome! Friday was a perfect day for a royal wedding, and we also celebrated it in style at St. Vigeans Hall. The doors to the café were opened at 10am and many came in wedding attire. There were games and crafts set up for the younger guests of the Royal wedding café and tea and coffee available for the adults. All the guests had a great time enjoying each other’s company as they watched the build up to the momentous moment of the marriage of William & Kate. The two churches believed that such a special day would be greatly enhanced for the people in the parish by offering them the opportunity to enjoy the wedding together and by offering the children the chance to meet with friends and participate in activities that they would enjoy. The hard work of the church members was rewarded by the smiling faces of children and adults enjoying the event together. Alice Menmuir (Session Clerk) on behalf of the Elders, Deacons and Congregation. There will be a coffee morning from on Saturday 19th of February, from 10am until 11.30 in Knox's Church Hall. The cost is £1 and there are various stalls and refresments. 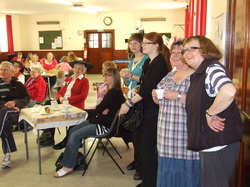 The Mother and Toddler Group is starting up in Knox's Hall on Thursday 10th of February 2011. Anyone wishing to help please let us know.